The software giant and world’s premier system of record, SAP, was on an acquisition spree over the last two weeks. First it spent $8billion on the acquisition of Qualtrics, a User Experience (UX) software that helps to collect and analyze data for market research, customer satisfaction and loyalty, product and concept testing, employee evaluations and website feedback. And then it acquired Contextor, a small little-known France-based Robotic Process Automation (RPA) product to augment SAP Leonardo’s intelligent technologies portfolio. It appears that SAP is starting to mix a heady cocktail that enables its systems of record with the triple-A trifecta (AI, Analytics, and RPA) and embedded UX capabilities. Tastes like the OneOffice? Well, definitely for SAP mighty front office portfolio, but the huge disparity between the $8bn splurged on Qualtric and - whatever negligible sum was invested in Contextor - does not excite us that SAP is in anyway deadly serious about dominating the back-to-middle office automation space, which is critical to knit together disparate processes and systems. What is the Digital OneOffice and why it matters? The OneOffice Framework is a guide to align the entire organization to driving a customer experience (CX) that gives them a competitive edge. This means breaking down the siloes between front, middle and back office so that information and data flows freely and enterprises are able to predict and cater to customer needs. OneOffice is realized when the needs and experiences of the customer are front and center to the entirety of business operations. This means enabling automated data flows between the customer interface, your customer-facing staff and operations staff in order to create common goals and outcomes across the organization. Hence the addition of Qualtrics has terrific potential to bridge critical gaps between customers and employees, and effective RPA provides a real gateway to digitize processes and create a gateway to broader AI possibilities. The reason behind the success of Qualtrics (and the driver for the 20X PSR!) is that Qualtrics-driven UX is not about just a fancy UI. Qualtrics enables SAP to offer solutions that combine front and back-office data. SAP is already a leader in managing organizational transactional data but lacked the capability to understand its implications on customer satisfaction, loyalty, and experience. With Qualtrics this is now a distinct possibility. Contextor’s addition is focused on providing the missing ‘A’ in SAP’s Triple-A Trifecta capabilities. HFS believes the “Holy Trinity” of service delivery is at the intersection of the Automation, Analytics, and AI or the Triple-A Trifecta. SAP Leonardo already has a portfolio of technologies across Machine Learning, Analytics, IoT and blockchain but lacked the basic automation capabilities that Contextor now provides. Intelligent RPA capabilities are scheduled for inclusion into SAP S/4HANA in the first half of 2019, with other SAP applications to follow. Automation and UX are hot areas with multiple robust Commercially-Off-The-Shelf (COTS) solutions that can integrate well with SAP environments. SAP itself is heavily invested (and rightly so) in building its own ecosystem with the SAP App Center where third-party solution providers can offer solutions that work seamlessly with SAP environments. In today’s world, it is unclear how much more an embedded functionality is worth compared to an ecosystem approach. SAP will need to justify why and how the acquired capabilities will offer a unique or better value proposition than standalone products. Qualtrics brings to the table a differentiated value proposition, especially when combined with SAP’s existing operational data and transaction processing market share. But only in theory. Integrated value proposition demonstrated through tangible use cases will be the real proof. The cultural mismatch between SAP and Qualtrics (as pointed out by Dennis Howlett here) will make it even tougher. When it comes to RPA, the software giants have been largely MIA. Before SAP’s Contextor acquisition, Pega is potentially the only other software player that recognized the power of RPA with its acquisition of Openspan RPA in 2016. It initially embedded bots into its BPM suite of applications and now gives away unlimited robots with its Pega Platform. Contextor itself is a very small player in the fast-growing RPA product market dominated by Automation Anywhere, Blue Prism, and UiPath. Power users of Contextor shared with HFS that it is a complex-to-use tool, requires coding experience, and has limited AI hooks. SAP opted not to acquire any of the big three RPA players (perish the thought at their hefty price tags!) and will possibly get basic RPA capabilities with Contextor. However, it will still need to convince clients about the advantages of using embedded RPA capabilities because the stand-alone RPA products can offer the same (perhaps even better). What’s so compelling about Contextor-driven SAP that requires a course correction from clients who are already on their intelligent automation journey? As with Pega, perhaps the answer lies in bundles bots as give aways. The other open question around Contextor is how SAP decides to position it internally and with clients. Consider the system integration space. APIs are real-time and resilient but RPA-driven integrations are brittle. IT purists love APIs but businesses don’t really care as long as it works. In reality, enterprises need both options as an “API-everything” world is impractical or at least not terribly timely. But will SAP look at RPA as a viable long-term option for automation or just as a temporary “duct-tape” till it gets the more robust (and expensive) functionality developed within the core application? Qualtrics enables the integration of back-office and front-office data while Contextor will enable automation from front to back within the SAP environment and outside. 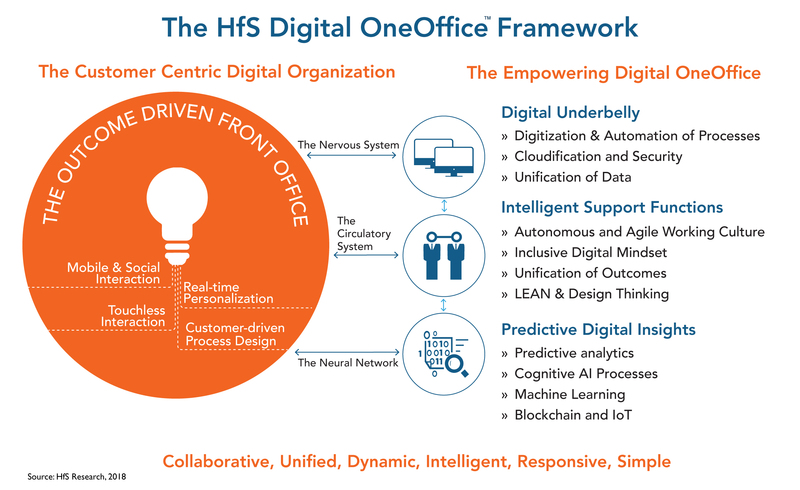 This is the HFS OneOffice vision where organizational silos start to converge to focus on real-time customer and employee engagement. However, the deep process requirements on the client side that are critical to find success with RPA, coupled with strong services partnerships needed to provide the technical expertise, reskilling and change management do not bode well for SAP to find much (if any) success with RPA. SAP has not proven particularly successful supporting complex process transformation needs of clients outside of the traditional SAP product templates (its BPO alignment division was quietly wound down several years ago) and the services partnerships that have been developed by Automation Anywhere, Blue Prism and UIPath are lightyears ahead of anything Contextor has forged (and some leading consultancies in the space had never even heard of the French firm). While it is understandable that SAP did not want to invest multiple-billions in a leading RPA solution, we believe it could have targeted a more established middle tier solution, such as Redwood (which is specialized with the SAP template), Softomotive, Kofax or Kryon. My guess is that SAP is just looking at RPA as a temporary option (in most cases - but not all) for automation. I can see SAP offering bundles bots to existing customers as a mechanism for interacting with non-SAP systems (free of charge - included in the existing enterprise licensing agreements. This is a viable option given that SAP did probably not pay a fortune to acquire Contextor. So I don’t think it is about ROI here). This is the short term goal. As you rightly said, the long term objective will probably be to drive customers to transition to a more robust and reliable automation functionality (API-based integration) that will also seamlessly integrate with SAP Leonardo (ML integration). But it is just a guess !